Although there are about 10,000 species of grass, and 12,000 legume species in the world, only about 40 are used for cultivation for hay, silage, and pastures. A forage manager must be familiar with the characteristics of these grasses and legumes and a few miscellaneous forages that will be productive in his/her area. After a grass has been selected, such as orchardgrass, there is still another step to final selection. Plants have evolved or plant breeders have developed different strains, or races of plants called varieties or cultivars. The term cultivar originated from the phrase cultivated variety which means a variety that was purposely grown. Varieties and cultivars are now equivalent terms in most U.S. texts. Breeders carefully choose plants showing strong characteristics, such as resistance to drought, winter hardiness, or shade tolerance, and selectively breed to produce seed that will continue advantageous traits in the offspring. Since different farmers have different needs and locations have different characteristics, there are often many varieties of a single species. There are many factors that make selective breeding of forages more difficult than grain crop breeding. 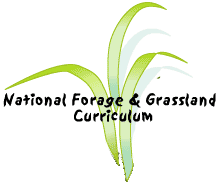 The diversity in forage crops: grass, legume, forb or sedge; annual-perennial; warm or cool season; bunch or sod-forming; single species or mixtures; cross or self-pollinating all contribute to the complexities of forage breeding. One seed catalog describing orchardgrass listed the following varieties: Common, Latar, Chinook, Masshardy, Wisc F52A, Pennlate, Sterling, Penmead. Seed companies and plant breeders are continually developing varieties to better match specific needs of growers. Forage managers should be aware of new varieties available and their possible advantages. This general description of orchardgrass offers a lot of valuable information but does not address all of the factors and considerations that are essential in the selection process. Investigating what strengths each cultivar has been bred to produce will help the forage manager to make a better selection. Use many resources (seed catalogs, vendors, the internet, extension publications) to determine the best variety for your uses. Another practice of seed companies is to blend varieties or even species together to make a mixture that offers more strengths. This also is possible when farmers plant a grass with a legume which is suggested in the last sentence of the orchardgrass description: "Its best use is for pasture in association with clover or alfalfa." Combining species requires a thorough knowledge of the attributes of forages. Generally, mixtures help to increase yield, offer a more balanced diet for livestock, or combine to provide more specific advantages, (such as; reducing bloat, extending the growing season, producing a more complete ground cover, or increasing protein content). Mixtures are generally one grass with one legume and are selected to be grazed or harvested at the same time. Warm and cool season grasses are not often mixed. Pastures can be planned to produce a year-round source for grazing in some areas. But no species has year-round maximum production.